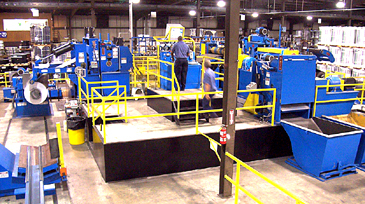 Jacksonville, AR - Lomanco, Inc, the largest manufacturer of commercial and residential attic and roof ventilators with production facilities in Arkansas and Arizona, has installed an Ultra-Precision High-Speed Single-Loop Turret Head™ Slitting-Embossing Line in its Jacksonville, AR headquarters facility. The new Slitting-Embossing line processes 60" wide surface-critical pre-painted steel and aluminum coils in gauges from .015" through .062" at line speeds to 1,000 FPM. 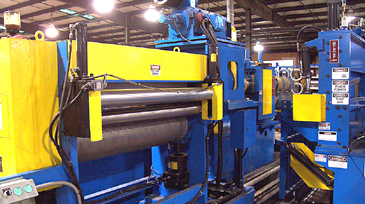 The slitting line handles 16" and 20" ID x 72" OD master coils and produces finished coils with a 16" ID with coil ODs ranging to 72". Finished coils can be embossed or un-embossed in side-trimmed or slit coil. Compact High Pass Line: The Lomanco Slitting-Embossing Line is a compact high pass line slitter designed specifically to process thin gauge surface-critical painted steel and aluminum coil. Compact high pass line slitters eliminate strip surface damage and offer quick coil threading, excellent coil tracking, and perfect coil side-wall build-up while occupying minimal floor space. The Uncoiler and Recoiler are installed at floor level while the equipment between is elevated to match the largest coil OD. 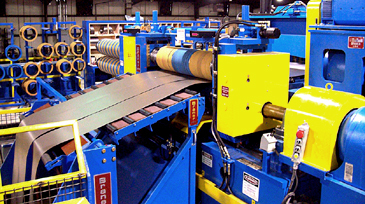 This concept eliminates reverse-bending of the strip against the natural coil-set as the coil is processed. Because the strip is never reverse bent, strip threading is quick and coil-breaks generated from reverse strip bending is eliminated. All strip deflector rolls are positioned below the strip therefore deflector rolls never contact the strip surface. Strip surface quality condition is preserved with the elimination of deflector roll induced surface scuffing and scratching. Compact High Pass Line Single-Loop Turret Head™ Slitting Line. 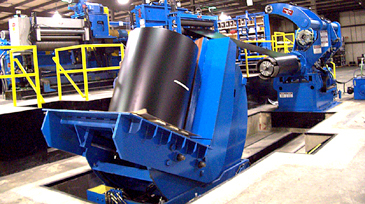 Entry Coil Loading: Lomanco's thin-gauge, pre-painted coils are stored "eye vertical" on pallets to protect the strip surface. Palletized coils are loaded onto a Coil Car-Tipper. The coil is upended 90-degrees, elevated and loaded onto the Uncoiler. Combining coil upending and coil loading functions into one machine reduces floor space requirements and minimizes handling and resulting coil damage. Entry Coil Car-Tipper upends and loads coils onto the Uncoiler. Embosser: A 75 HP Embosser with stucco and gain pattern etched rolls is installed in the entry section of the line. The Embosser is power injected in and out of the line to allow embossed and un-embossed full width and slit coil to be produced. The Embosser is synchronized with the Turret Head™ Slitter for tight-line and loop slitting when injected into the line. Embosser is set-up to be injected in and out of the line. Ultra-Precision Turret Head™ Slitter: The Turret Head™ Slitter is equipped with two (2) 8.000" quick-change ultra-precision slitter heads that allows Lomanco to consistently generate close-tolerance light-gauge surface-critical slit coil with minimal slit edge burr. The patented Turret Head™ design features unobstructed access to the slitter arbors, which makes tooling loading and unloading quick and easy. Re-tooled slitter heads are exchanged in less than 2-minutes. Quick tooling set-ups and quick head changes makes the Turret Head™ Slitter ideal for short run orders. The Slitter is powered by a DC motor that allows full loop slitting of all gauges from .015" through .075". Turret Head™ Slitter exchanges slitter heads in less than 2-minutes. Surface inspection is accomplished s the strip leaves the Slitter.